It might be interesting to look at some stats of this blog. I have visitors from no less than 98 (!) countries, and most visitors come from the US. 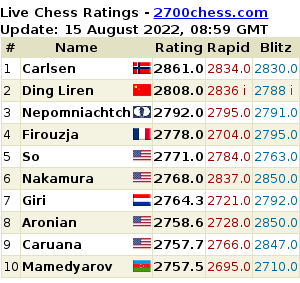 Due to the big time diference to Khanty Mansiysk (UTC/GMT +6) most chess fans in the US get up in the morning, only to see the result of the games. When the games start in KM at the local time 15:00, it is 05:00 in New York and 02:00 in L.A. You must be a big chess fan to get up in the middle of the night to watch the games live! I was very surpised to see in the stats, that many chess fans from the Islamic Republic of Iran visit the blog. But since Twitter is blocked in Iran, it makes sense. Check your time zone. Click to enlarge. The pairings of round 11: Andreikin-Mamedyarov, Topalov-Karjakin, Svidler-Aronian and Kramnik-Anand. Indian chess fans, almost in the same time zone as KM are excited and tweet: @reachvsara: “Vlady vs Vishy today at #Candidates2014 from the opposite of the spectrum of pre-tournament expectations! #BearTigerTango“. @asimpereira: “Never underestimate a wounded Bear or a resurgent Tiger! #KramnikVsAnand #GOTD“. Asim has developed many good chess Apps for your mobile device, like the official 2013 world chess championship app! Better watch some chess then! Wait, maybe not: “Spent all morning trying to find details of the prize fund on the official website.” Looks like a busy morning for @FSTIMJP. Many chess fans have to work (games start at 10:00 in Central Europe), but…@Sandra_Hohmann. “As usual, the #candidates2014 are distracting me from work … Kramnik-Anand could get really exciting today”. The crowd is going mad! Let’s find out what is going on in the early stage of the games. : @mathcasualty: “Svidler-Aronian looks like boredom waiting to happen and Kramnik-Anand looks like another theoretical draw” Philip Goh added in his second tweet: “Andreikin-Mamedyarov is already a very quiet queenless position; only Topalov-Karjakin seems to promise any violence”. @asimpereira: “Whats up with the players? All 4 games have played g3-Bg2! #CopyCats“. After around 2 hours of play @Jonathan_Rowson tweeted: “Kramnik-Vishy game feels very drawish now. Activity (almost) fully compensates for the extra pawn on a2.” So the logical result in the game between two good friends:“@vishy64theking comfortably draws with Kramnik to reach 7.0/11, getting closer to his 6th world title match”, according to @ChessVibes. The other games: @peterlism“: It really looks like a draw in every game today. Doesn’t really change much, just more pressure on Aronian”. But the next game to finish was… Svidler-Aronian: @ChessVibes: “Now @LevAronian has also drawn with Svidler which is even more good news for @vishy64theking” and a few minutes later @ChessVibes added: “Andreikin vs Mamedyarov also ended in a draw”. @ChessVibes: “The last game Topalov-Karjakin also ends in a draw, with Karjakin perhaps missing some chances. @traderDXB has some good advice: “Anand, you have to get in shape. I suggest you signup for military style bootcamp before next Magnus match”. @OlimpiuUrcan: “An Indian neighbor: an Anand comeback v Carlsen would be #Bollywood material: the rejuvenated father v the Norwegian genius”. One final tweet, or is this already poetry? “Tweet of the day” by former Candidate Teymur Rajabov, @rajachess: “When you have played a good game of chess, you can find out what paradise really looks like #justanopinion #chess #mind #paradise #bestgame“.